Instead of castle, it is better perhaps to call it tower of look-out. Situated above a rock, where now is the ruin, it served for look-out and signalings, dominating three valleys. It's believed that it was built under Pietro of Toledo, the viceroy of Napoli, in the year 1535. It was him to order such constructions, to signal the arrival of the Turks, harsh hostile of the Christians. Such vigilance was abandoned around 1571 with the defeat of the Turks in the battle of Lepanto. The ruin has a base of around 8 meters and tall 13. It is constituted by only one wall (see photo) with a window where, there was perhaps a bell. The tower had to have a square form; the entrance door was towards midday, and to enter about ten steps were dug on the same rock, that are still visible. Other versions, less probable, place the construction to the time of the Norman (around 1000 AD), always as sighting to protection of the castles of Ariano and others. Its almost total collapse happened in 1732. To the beginning of November a strong earthquake demolished the tower and divided the rock now visible broken at the base of the wall. Around this tower there is a splendid walk in which, during windy days, if the borea blows you walk to west, if the mistral blows you walk to east. In 1898 the road was enlarged by the mayor Cav. Rainone and, during the following years, by other mayors. To the extremity, where the road turns to rejoin to the other slope, there is a small breadth, said Ariella. The Castle, as we call it, is situated on the top of the town, at the end of Nova Street - Castle Street to West -, and it is a medieval tower of look-out, half-demolished. After the 1732 earthquake, that shaved completely to the ground the country, only a part of a wall has remained that has assumed the form of a closed hand with the index aimed to the sky, with the hole of a window in the middle. The tower, even if conceitedly named " Castle ", is anyway suggestive and unique, and, why not, beautiful. The technique with which it was built, founding ourselves on the ruin preceding the 1984 last reconstruction, was that of the construction for lines of irregular stones prepared in horizontal sense. Nothing of sophisticated, therefore. The origin is uncertain. There is who attributes it to the Byzantines, who to the Norman ones (1000 ca. ), who to Fred II (1260 ca. ), who to Charles I of Angiò (1270 ca. ), who to Pietro of Toledo (1535 ca.). Let's try to understand a little more and go back to the past, proceeding for exclusion. The Spaniards (Pietro of Toledo) disseminated the whole kingdom with signaling towers to oppose the raids of the Turks. But it is true also that their building techniques were very sophisticated, with arab influences and with geometric joint of stones' placement. But there are at least others two elements to consider, for and against this thesis: 1) given the urgency of the defensive system on the whole territory, the Spaniards not only built, but also recovered old existing signaling towers; 2) to build the defensive system they could have used the techniques of the place, more consistent to the type of local stone (porous, friable, little aesthetics), as after all surely also the Guevaras did (Spanish they too), that had been ruling our lands since 1563. Till now, therefore, we would be able at least to say that, if not built, the tower was at least adapted from the Spaniards, even if the structure is technically different from any other Spanish construction of the period in other places of the kingdom. And what about Charles of Angiò and Fred II in the XIII century? Given the well-known rivalry between the two, it's to say that it would be very difficult to think to a Fred II " arronzone " and to a Charles of Angiò who was not able to do better than the rival. Charles of Angiò, however limited hismself to recover, (not, therefore, to build new ones) all the old existing towers, aimed to defensive signaling. But if so it was, the Castle would already have had to exist to that time (first, therefore, of 1270), or not to exist entirely. It's true that Fred II, few years before Charles I, disseminated Puglia with castles. But it is also true that his castles were essentially buildings aiming to the prestige, besides the real defensive function. In them not little part was devoted to the aesthetics and the imagination given his Arabs likings. For this reason I would exclude this origin for our tower wall, rather thin and with stones set in horizontal lines, without any geometric and aesthetical criterion, both in the structure and in the look of together. In fact the simplicity and the sturdiness of the whole Castle let us think to a more practical than aesthetical purpose, and perfectly defensive. Therefore, precedent? Last two considerations to make, and decisive, are on the boundaries walls. 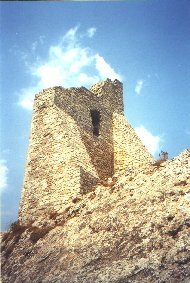 The constructions from the year 1000 in then, Byzantine or Norman that has been, all have, in effects, the same constructive technique as our tower, verifiable in many other castles and towers in the near towns (Bovino, Accadia, Zungoli, Ariano, Anzano, etc.). But the trace of the boundaries around the Toppolo (next to the " nevera " ) point out that the tower was built outside themselves (cfr. L. Carchia, G. Procaccini), really strange thing. As if there had not been any sapce (!) inside the town for a tower like that. Therefore, the tower is of a following epoch to the building of the boundaries walls (about year 1000, by the Greeks - Byzantines). Second consideration. The walk around the Castle, in every its point has such a course to let us think of an ancient defensive structure: as to prevent an access. It would seem, therefore, reasonably contemporary to the building of the tower . The present itinerary could have been drawn, in fact, from a preceding defensive enclosure, made of walls. But, if Panni's walls were demolished (by Normans, taken over to the Greek, because thought useless) already toward the half XI century, it would have been absurd to have built others, immediately after, more indefensible and straight external to the preceding. Just like it would have been absurd to have built them previously, excluding the tower of them. The most probable hypothesis, therefore, is that of a signaling tower built with local technique by Pietro of Toledo around 1535 and defended by a modest enclosure that left, to a local garrison, at least the time for the signaling.